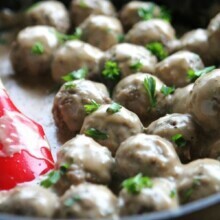 This Swedish Meatball recipe is quick, easy, and tasty! With a simple sauce, serve these Swedish Meatballs over egg noodles or rice and potatoes! In a large cast iron skillet, melt butter over medium heat. Sprinkle in flour and whisk. Cook 1 minute and slowly whisk in beef stock to prevent lumps. Cook 3 minutes or until the sauce starts to thicken. Reduce heat to low and melt in sour cream, salt and pepper. Add in frozen meatballs, stir to coat and cover with foil. Cook 10 minutes or until meatballs and heated through.